A large study led by Drs. Wayne McIlwraith, Frances Peat and Chris Kawcak from the Orthopaedic Research Center at Colorado State University, working with Dr. Jeff Berk from Lexington, KY., commenced at the 2016 Keeneland September Yearling Sale. Horses included in the study last year as yearlings were identified at 2-year-old sales in 2017. Researchers were able to follow 78 percent of all eligible 2-year-olds, which had consignor permission for radiographic inclusion in the study as yearlings, due to a great understanding within the industry of the need for this research. This study will look at two issues that are typically the most-discussed findings by buyers, sellers and veterinarians alike: radiographic findings in the proximal sesamoid bones of the fetlock with associated suspensory branch changes, and radiographic findings in the medial femoral condyle of the stifle. 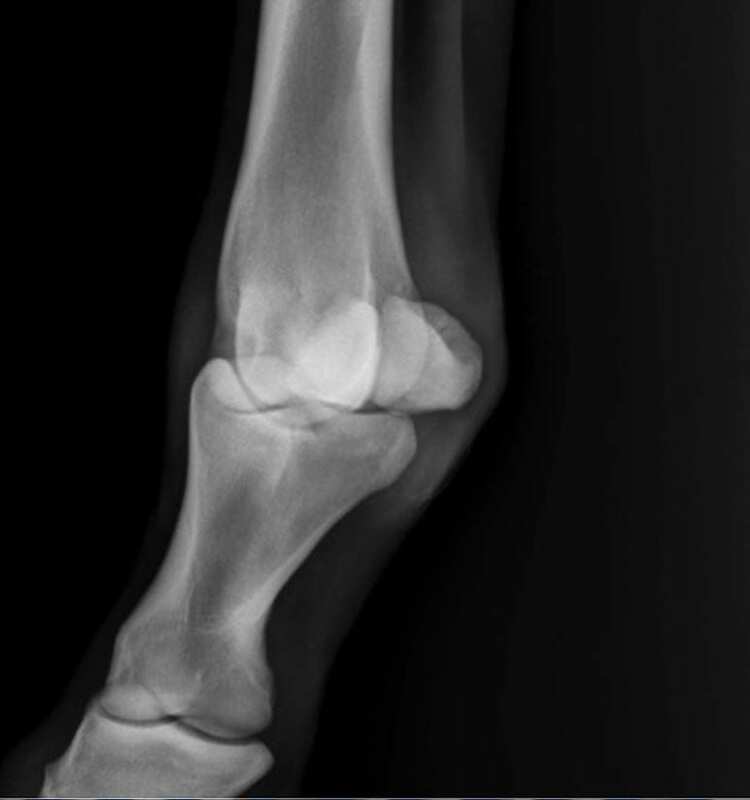 Since repositories were introduced to Thoroughbred auction houses in the 1990s, a degree of uniformity in radiology has developed, particularly for OCD lesions. However, some radiographic changes remain a persistent source of controversy for sellers, buyers, trainers and veterinarians. That is why sesamoiditis, and lucencies or subchondral cystic lesions (SCLs) of the medial femoral condyle, are the focus of this study. An initial study prior to both digital radiographs and the repository system was performed 15 years ago by Drs. McIlwraith, Kane, Park, Rantanen, Moorhead and Bramlage. A second study prior to digital radiographs was performed by Dr. Spike-Pierce and Bramlage. These studies led to more questions about sesamoiditis and could not address the stifle lesion question at all because of the lack of digital radiographs. Since then, there has been investigation of sesamoiditis relative to development of suspensory ligament branch injury by Drs. McLellan and Plevin in Florida. A study that specifically investigates sales horses and follows them at yearling and 2-year-old sales with radiographic and ultrasonographic examination (as appropriate) has never been performed. The first phase of the study was conducted at the 2016 Keeneland September Yearling Sale with excellent collaboration from the sales company and consignors. Consignors presenting yearlings at this sale were asked permission to include the yearlings in the radiographic and/or ultrasonographic portions of this study. Radiographic permission was granted by 71 consignors, resulting in a total of 2,795 yearlings, or 74 percent of all yearlings presented for sale that had radiographs available. Of these 2,795 yearlings, suspensory branch ultrasonography on 704 horses as performed on farms before they shipped to Keeneland. The radiographs have been evaluated for changes in the sesamoid bones and the medial femoral condyles of the stifles. The ultrasound images will be evaluated for abnormalities involving the suspensory ligament branches at their insertion onto the sesamoid bones. The second phase of this project followed horses that had radiographs included in the study as Keeneland September yearlings, to five of the major 2-year-old sales in 2017: the Fasig-Tipton Gulfstream Sale, OBS Select Sale, OBS Spring Sale, Fasig-Tipton Midlantic Sale and OBS June Sale. Permission for inclusion in the second phase of the study was granted by 45 2-year-old consignors, for 78 percent of eligible horses. This amounted to 473 2-year-olds on which to evaluate radiographs and 415 of these horses also had suspensory branch ultrasounds performed for the study prior to the under-tack shows. Researchers will again evaluate the sesamoid bone/suspensory branch complex and the radiographic stifle lucencies in this group of horses. The third phase of the project will follow the racing performance of these horses, culminating at the end of their 3-year-old year. This study will be the largest of its kind and will yield information that will be extremely useful to those involved in the selection process of sales horses. It will aid veterinarians in providing their buying and selling clients with a more accurate assessment of the significance of these findings. It will also help those in the Thoroughbred industry gain an understanding that not all radiographic findings are contributory factors to any given horse's suitability for racing. With the cooperation of the sales companies, consignors, owners, and veterinarians, this study stands to significantly benefit all involved in the sales process. Paired radiographs and ultrasound images will enable the progression, regression, or static nature of certain radiographic and ultrasonographic findings to be studied, under the conditions in which these sale horses are managed. The sheer size of the study, which is necessary to assure its statistical significance, plus the requirement to employ individual veterinarians with skills in performing the ultrasonographic and radiographic reading, will result in crucial information for the industry, but also a large expense. The cost of Year 1 of the project was $175,000 and the overall price tag for the four-year study is estimated to be approximately $445,000. Bridge funding was obtained for the first years' expenses from discretionary dollars at Colorado State, but it is the hope of the researchers that individuals from the industry will contribute to costs. To read more, please visit Colorado State University College of Veterinary Medicine and Biomedical Sciences. This entry was posted in Vet Topics and tagged 2-year-old sales, Chris Kawcak, Colorado State, CSU, Frances Peat, Orthopaedic Research Center, radiographs, sesamoiditis, suspensory ligament, Wayne McIlwraith, yearling by Edited Press Release. Bookmark the permalink.